AMPA receptors are one of the most dynamic components of excitatory synapses. They are responsible for most excitatory transmission in the brain, and therefore, their presence at synapses is tightly controlled. We now know that AMPA receptors reach their synaptic targets after a complicated intracellular trafficking pathway, in which almost every step is subject to precise regulation. In particular, neuronal activity is able to trigger the addition or removal of AMPA receptors at synapses, leading to long-lasting forms of synaptic plasticity known as long-term potentiation (LTP) and long-term depression (LTD). 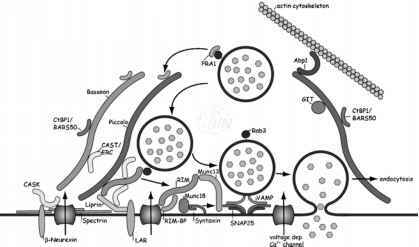 This chapter summarizes our current knowledge of the intracellular trafficking of AMPA receptors, and its relation to synaptic function and plasticity.